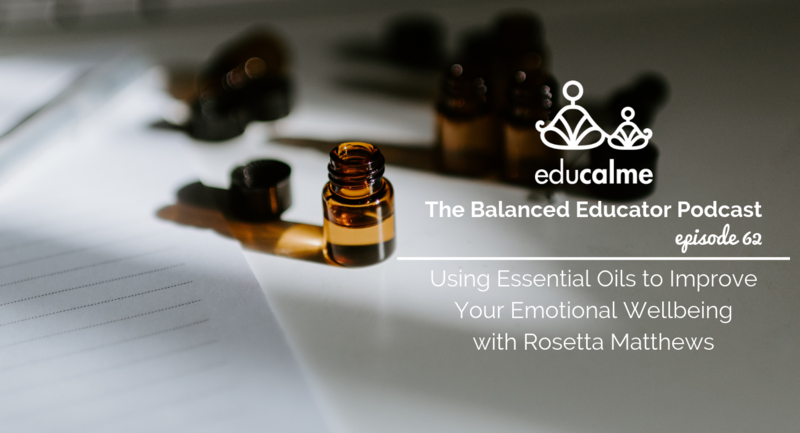 In this episode of The Balanced Educator Podcast we invited Rosetta Matthews back on the show to teach us how to use essential oils to improve our emotional wellbeing. Rosetta Matthews is a Certified Rehabilitation Counsellor (CCRC), Human Ecologist (B.H.Ecol.) and a Certified AromaTouch Instructor. As a Wellness Advocate (doTERRA) she has focused her career for the past 8 years on inspiring individuals to transform their lifestyle though empowering them to engage in holistic, self-directed healthcare with naturally sourced solutions. She is also a passionate doTERRA Leader and Mentor who inspires people to overcome obstacles, limiting beliefs and to set action based steps to achieve their goals. Rosetta explains how to incorporate essential oils into our lives as a therapeutic benefit when it comes to our holistic health. Rosetta explains that essential oils have medicinal qualities such as sedative qualities, anti-anxiety qualities, anti-depressant qualities and uplifting, mood boosting qualities. And gives examples of essential oils that have each of these qualities. We share lots of different ways to incorporate specific essential oils into our daily routine to help us with our emotions. We talk about essential oils that can help us to sleep better, to reduce stress and anxiety and to uplift and boost our mood. Rosetta explains how to use essential oils safely with babies, children and adults. We talk about the best essential oils to start incorporating into your life when you’re just getting started. This episode is perfect for you if you want to know how to use essential oils to improve your emotional wellbeing or if you want ideas of how to incorporate essential oils into your self-care routine. If you would like more information on essential oils as well as a list of great DIY recipes, click here. You can contact Rosetta by call or text at 204-794-5942 or by email at contact@rosettamatthews.com.